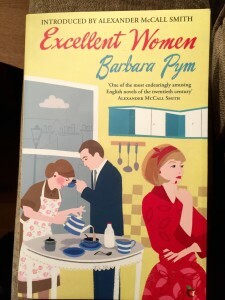 This entry was posted in Asides and tagged A Good Read, Angela Thirkell, Barbara Pym Excellent Women, BBC Radio 4, Lissa Evans Crooked Heart, Max Porter Grief is the Thing with Feathers, Podcasts, Virago Modern Classics by Simon Lavery. Bookmark the permalink. Oh, I do feel for Mrs. TD – I had a cracked tooth which led to hours of agony, then root canal and then finally an extraction. Quite hideous and worse than childbirth I think. Sending sympathy…..
Best wishes for Mrs. TD. Root canals are miserable but once they are done, the tooth will give you much less misery. I hope she enjoyed her soft food as much as possible. Mrs TD appreciated your thought, thanks. And for the ED quotation – apt. No, I haven’t read any of these. Somebody sent me a copy of Grief is the Thing With Feathers, but my parents had just died within 18 months of each other and I was in no mood for reading about grief. I read both Old Baggage and Crooked Heart earlier this fall and loved them. (Still holding out hope I might write about them…) Turns out they are linked and OB follows from CH, but reading them in the “wrong” order made no difference. They can easily be read as stand-alones. OB is particularly good, but I recommend both highly. They’re a little sweet, but also a little acerbic, and never sappy. They do kids well. They don’t romanticize history. Good stuff all round. A Good Read has been a favourite of mine for 20 years, when I discovered it quite by chance. I have read Pym’s Excellent Women, but neither of the other two. I’m now in Trégastel, Brittany, for the holidays and I’ve brought Jane and Prudence with me. P.S. The weather is glorious, we walked along the coastal control path (the GR 34) in the afternoon and people were sunbathing (and actually bathing) and tomorrow I’ll definitely have a swim ! I don’t know whether I should enjoy or worry about climate change though. Isabelle: thanks for dropping by and commenting. I hope you enjoy Jane and Prudence: maybe look up my post on it when you’ve finished! Beautiful day here in Cornwall today, too. I can really recommend Lissa Evans: I have loved all her novels. I wrote about her so enthusiastically on the blog that we have become friends, but my admiration for her did pre-date that! Her books are very funny, and I think can be under-rated because of that, but she has a human understanding that I think is wonderful. Old Baggage, the most recent one, is a unique and wonderful book, about the later life of a suffragette. It is a prequel to Crooked Heart. Moira: thanks for that – most helpful. I saw some of your Twitter exchanges with Lisa today – the faux diary – how great that you hit it off like that! I really enjoyed Old Baggage, which I reviewed some time this year, I think. Ali liked Crooked Heart and Old Baggage and I’d def read CH when I get a gap in the endless reviewing responsibilities (I’m lucky to have them, is all my own fault, etc.). Thanks for the feedback, Liz. I’ll go take a look at your review, and Ali’s. Our Book Club will read Excellent Women next March. I’m looking forward to it. If you haven’t read it by then, you’re welcome to read it along with us.